While some words contained in the poem are fairly clearly legible (lines three through seven read, for example, “once / in / premise / on,” lines nine and ten read “short / stead”), they in no way form cohesive sentences, or even phrases. The text is readable, but nonsensical. The few scholarly discussions of the poems, such as in Andy Weaver’s “Writing through Merce: John Cage’s Silence, Differends, and Avant-Garde Idioms,” and Sean Braune’s “Cage’s Mesostics and Saussure’s Paragrams as Love Letters,” as well as a number of my own conference papers on the sequence (which, at the time that I write this now number three), attempt to read or to interpret the poems in pieces. All three of us note the semantic complications, but, nonetheless, our attempts to read intimacy or love into the poems, however “protosemantic” (Braune), court exegesis in a poetic sequence that repeatedly reminds us that this process is doomed to fail. That is, I would like to argue here that the Cunningham mesostic sequence is, above all else, a metapoetic series that rails against exegesis, against hermeneutics in general, and against the inherent overcoding of semantic language. Moreover, I argue that the poem seeks pure communication (getting back to the heart of the term, the comunis or communal), rather than a limited communication based on militarized language. As such, attempting an exegetical reading of Cage’s linguistic noise betrays the goal of a postanarchist literary theory. Instead, the work invites us as readers to be attentive, rather than interpretive, readers. In this attentive reading process, the reader is invited into affective relationships with the words, letters, phonemes, and morphemes that make up the mesostics. In a sense, then, the poems become notations for a reading public[iii], who perform the piece (who “sing” it) as they read. What’s more, for Cage, this division of text as notation and reading as performance is one that adds an additional level of chance or indeterminacy in the production of textual meaning. That is, “[c]omposition becomes distinct from performance. One cannot determine exactly what effect the notation causes – thus, indeterminacy” (“Form is a Language” 135). So, the chance-determined form of the poem[iv] plays a role in the chance-determined affective meaning of the text for its readership that is similar to the unbiased coin-toss of the I Ching chance operation. The various-sized letters perform their noise-function, disturbing exegetical or interpretive reading habits, but remaining fascinating all the while. “Inging” is Cage’s especially endearing neologism that appears in “Mesostic 19” (M 82). While semantically nonsensical – there is, of course, no OED entry for “inging” – the word functions in Cage’s context as a sort of urverb, that implies something like perpetual doing, on the one hand, and on the other, a pure linguistic transience, a mis en abime verb that folds in on itself, repeats itself, means itself. A feedback-loop of noise. Repetition is one means of robbing a signifier of its semantic meaning; a word gets repeated so many times that the Saussurian arbitrary relationship between signifier and signified gets pulled apart. “Inging” is infinite, indefinite repetition. It sits in the mesostic as a fulcrum: towards the centre of Cunningham’s name, the first “g” holds it in place. The letters themselves increase in size, the first “ing” is much smaller than the second. Does the noise of “inging” get louder, more disturbing, as it continues? Feedback loop or Yeatsian gyre? And, interestingly, the final “g” is written in a cursive font (the only cursive on the page), connoting both interconnectivity between letters and an expected continuation. The lack of another letter after the final “g” suggests emptiness, invites a rereading of the word. 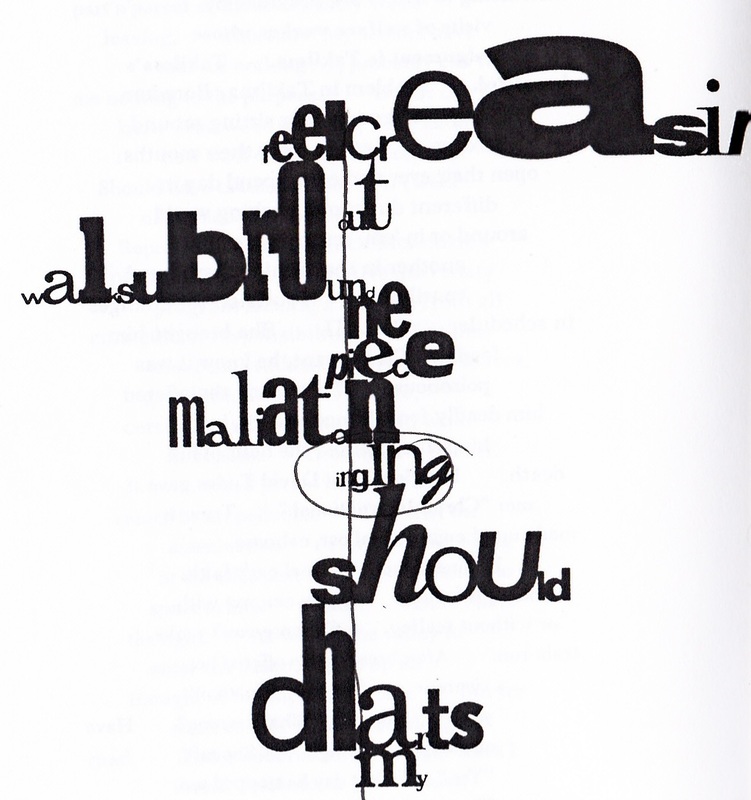 This is especially striking in light of the sheer size of other letters in the poem; the “ea” in the first line, the “bro” in the third, the “hou” in eight, and what appears to be an overlapping “d” and “h” on line nine, are all enormous, demanding the reader’s attention away from the blank space, and the otherwise unassuming “inging.” I leave you my own pen-marks. I want you to pay attention. [i] And here I use this term much in the same way Brian Massumi uses it in Parables for the Virtual: Movement, Affect, Sensation. He writes: “Intensity is qualifiable as an emotional state, and one that is static – temporal and narrative noise. It is a state of suspense, potentially of disruption” (26). [ii] I will admit that Cage seems particularly uninterested in redefining music in order to allow for the inclusion of these sounds. In “The Future of Music: Credo” he writes: “If this word, music, is sacred and reserved for eighteenth- and nineteenth-century instruments, we can substitute a more meaningful term: organization of sound” (55). This said, in his earlier percussive work, Cage had a stronger interest in redefining the musical field, as evident in Pence James’s “People Call it Noise – But He Calls in Music” (a review of a percussion concert composed and delivered by Cage and others in 1942), wherein Cage is quoted in saying that his music was not an “end in itself, but we are trying to make all the field of audible sound available for music” (62). In his later work, however, Cage seems much happier to have the audience/reader focus his/her attention, than to dismantle the categorical structures that govern the genre-placement of his work. [iii] And, of course, I’d be remiss if I didn’t mention here that the poems also literally serve as notation, and are performed as a musical piece for solo voice, famously performed by Demetrio Stratos, and later by Eberhard Blum. The performance of the piece uses the size and font of the letters to denote volume, tone, and length of each letter’s pronunciation, thereby enforcing an affective reading of the text. [iv] From the “Forward” to M: “ I used over seven hundred different type faces and sizes available in Letraset and, of course, subjected them to I Ching chance operations” (ii). To play the devil’s advocate: you write that “Cage’s decision, then, to incorporate noise into his compositions is a political one that seeks to defamiliarize our relationship with noise, as it allows his audience to pay particular attention to those sounds that make up music.” How is this decision “political”? Is there a dismantling of hierarchies at work? Also, while I take your point about avoiding exegetical readings of the 62 Mesostics, do Cage’s comments about the sequence in his introduction invite or privilege certain readings? Certainly, Cage’s defamiliarization of noise is political in that it breaks down hierarchies of what is and is not music (art, poetry, meaningful, etc). It also disrupts the hierarchical relationship between author/reader, composition/situation, text/interpretation. And it also, in a sense, seeks to disrupt a hegemony of subjectivity: if all noise is always already music, the listener must then interrogate how social institutions have put in place the same limiting processes of naming and designating. Additionally, I have been thinking a lot about how these descriptions of the indeterminate or chance produced texts by the author necessarily shape/limit potential readings. In Jackson Mac Low’s work, for example, he places a good deal of privilege on these procedural descriptions. Cage is somewhat less interested in guiding the reading process in that way. On the one hand, these descriptions emphasize process over end-product, and that is positive and postanarchist. But, they also close off potential readings so long as we understand them as external markers guiding textual readings. Poetics, such as Cage’s forward, can actually open up potential readings, though, as long as the reader always understands them as doors to new available readings rather than skeleton keys that unlock exegetical secrets. A task easier said than done, to be sure, but one that move reading away from a hermeneutical privileging of authorial intent. It’s tricky, but when Cage tells us he failed but liked the poems regardless, he’s urging us to note process without looking for the answers it may provide. Poetics as a proliferation of possible meanings? That’s an interesting idea. I suppose it depends on who is writing the poetics? Definitely true. Marinetti’s poetics, for example, close off his poetry (and make is morally difficult, too). But, Marinetti’s work, and the mandates of Futurism, are really instructions. I still firmly believe (and perhaps this is my own preference at play) that the poetics of the vast majority of the authors in my project, open up their poetries rather than limit them. Yes, I would agree. Even Levertov’s poetics occasionally seem to argue for an openness to multiple readings that her poetry doesn’t really prioritize. I really like your reading of “inging.” I love how you break it into IN g IN g and how it becomes a sort of informatic poem that represents communicational feedback ad infinitum. In information theory feedback is noise. I wonder what is “in” g for Cage? The next mesostic? Cunnin—g—ham? Ca—g—e? am confused how ‘message’ (militarized language) imparts limited communication and ‘non-message’ pure. Would not the use of words—artifice—compromise the work to that same limitation, except without contribution to the purpose of their use? Yeah. I’m confused about it, too, sometimes. For Cage, delivering a “message” through language is not inherently bad. He just wants us to be aware of how language gets militarized through limitations like syntax. Artifice will always limit readings — but there is no reading without artifice, too. The difference is that a text that is not militarized, not so “message-driven” (like the Cunningham mesostics, for example, but also any asyntactical/nonsyntactical poetry) is less confined by those pesky things, meaning and sense, which severely limit meaning. They’re noise. Like radio static vs. a pop song. Throbbing Gristle!! Yes, and Cage was especially pro-electronic music — he pioneered experimental electronic music, and is often listed as a major influence for the anarcho-punk scene in the 70s. Although, I always thought of Cage as more Sonic Youth than anything else. The Cunningham mesostics are maybe his most radical work. Most of his other stuff is more semantically sensical.